When grilling is out of the question and you don't want to splatter your cooktop too much (the burgers are initially seared on the stovetop), try this recipe for oven-baked burgers. A little Worcestershire sauce, steak sauce, garlic powder, and cayenne pepper kick up the flavor quotient and helps keep them juicy. Serve on toasted hamburger buns (homemade or purchased) with your favorite sauce or a flavored mayonnaise, with or without cheese. In a large bowl, combine the ground beef, steak sauce, Worcestershire sauce, salt, black pepper, garlic powder, and cayenne pepper. Blend thoroughly. Shape the meat mixture into 6 equal patties. Heat a heavy, oven-safe skillet or grill pan over high heat on the stovetop. Sear the patties for about 2 to 3 minutes on each side, just enough to brown. Transfer the pan to the oven and bake for about 10 to 15 minutes longer, or until the burgers reach a food-safe internal temperature of at least 160 F.
Serve the burgers on split toasted buns with optional cheese, tomatoes, lettuce, and pickle slices, and the condiments of your choice. Heat the oven to 400 F and line a rimmed baking sheet with aluminum foil. Place a wire rack over the foil-lined sheet pan so it is 3/4 inch above the surface of the pan. Lightly coat the wire rack with cooking spray. Arrange the patties 1 inch apart on the rack. Bake until they reach an internal temperature of 160 F for beef and 165 F for poultry. You also can make these burgers with ground turkey or chicken thighs, but keep in mind, the safe minimum internal temperature for ground poultry is 165 F.
Instead of hamburger buns, try English muffins, focaccia, rye bread, sourdough bread, ciabatta, pita, or your favorite base to build a spectacular burger. Add Mexican flair by spicing the burgers up with 1 teaspoon of taco seasoning or a Cajun or Creole blend and reducing the salt to 1/2 teaspoon. Instead of American cheese, use pepper jack, mozzarella cheese, or blue cheese. 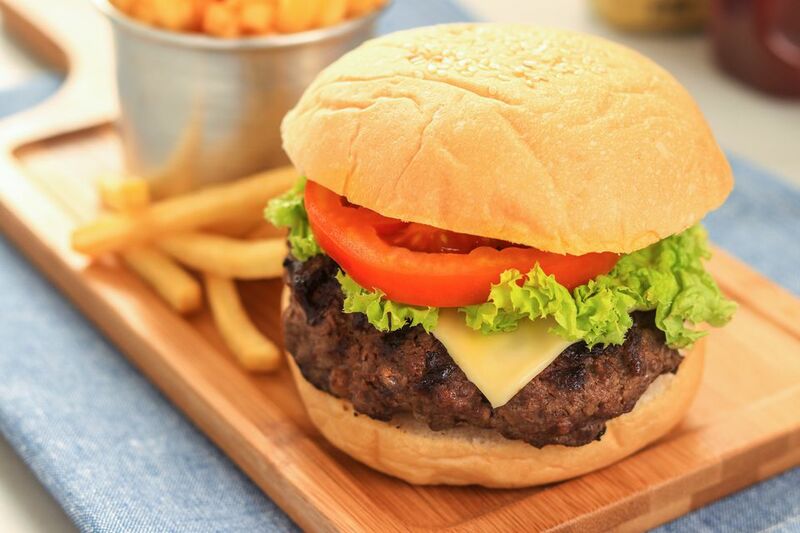 Instead of adding cheese after the burger has finished cooking, when they are 2 degrees shy of 160 F, place the cheese on top and return them to the oven for 1 minute for it to melt.